My son is in his final year of primary school this year. Whew. Let me rest after that sentence, because I can’t quite believe it. I’ll say it again: my son starts high school next year. I think it’s more terrifying than when he started kindergarten – because now he’s not just walking across the road to a school of 20 kids, he’s getting on a bus and travelling for 40 minutes to an enormous school with 700 kids. So yes, his transition from primary school to High School is much on my mind lately, and I am watching him, hoping that he is mature enough and resilient enough to cope with the big wide world of spiteful teenage girls and boys that will want to punch him and teachers that don’t know him from a bar of soap. His teachers are watching him too, along with his class mates of course, and they want them to step up academically, to put the effort in, to take more responsibility for their learning. In this spirit, their teacher has given them each a book to read from Australian author Jackie French. Jackie French has written many books for children and young adult readers and is known for not shying away from writing about difficult topics. In other words, she has great respect for her readers. I decided that was better than finding him playing Clash of Clans in the middle of the night, plus he was learning – and so was I. “Mum, did you know that the reason the Vikings called it Greenland was to throw people off – it was just all ice. Same for Iceland, but it was all beautiful and green.” Um, no, I didn’t know that – awesome! He finished that book within a week, earning an award from his teacher, and was hungry for more – although he was concerned it might have been the only good book that she had written :). On his kindle I bought him Hitler’s Daughter, which he devoured in 24 hours. Next I bought him A Waltz for Matilda, inspired by the iconic Australian folk song Waltzing Matilda. This was the first book in a three part series – so I decided to pay a visit to the library to get the others. I’ll do almost anything to facilitate his reading, but he was sending me broke! As he’s reading the second book in the series, The Girl From Snowy River, he gets up and starts walking around the lounge room. “Mum, she’s just broke her back. I had to stop reading for a bit.” Of course he goes back, but after a while, he gets up again. “Mum, this sounds weird, but my back is hurting now!” I look at him in wonderment, knowing that what I am witnessing here is the birth of empathy – which as we all know, is painful. A book can change a child’s life; a book can change the world! Every book a child reads creates new neurons in that child’s brain. If you want intelligent children, give them a book. If you want more intelligent children, give them more books! Jackie wrote her first children’s book `Rainstones’ in a desperate attempt to earn $106.40 to register her car, while living in a shed with a wallaby called Fred, a black snake called Gladys and a wombat called Smudge. The editor at HarperCollins said it was the messiest, worst spelt manuscript they’d ever received. The mess was because Smudge the wombat left his droppings on the typewriter every night. The spelling was because Jackie is dyslexic. Jackie recommends all beginning writers misspell their first book so it stands out of the pile. Don’t you just love her already? Fixed vs Growth – the Two Basic Mindsets That Shape Our Lives by Maria Popova for Brain Pickings. Every week I get a Brain Pickings newsletter delivered into my inbox, and there they have been steadily building up, creating a towering pile of virtual information, as things are wont to do if they take more than a minute to read or there is no urgency attached to them. The thing is, there is always a piece of gold in these collections, without which my life is a little poorer – so even thought I am a ruthless deleter, I don’t delete these. Instead, I have been reading an article each night while I sit with my daughter while she goes to sleep. This article goes beautifully with the education and learning theme of my opening rant (as I call it in my head), which could be a sign of this being a well thought out blog post, but alas, isn’t :). Truthfully, I never know what I am going to write until my fingers start tapping the keyboard, and everything just falls into place underneath it :). I found this article absolutely fascinating – click here to read more. I was in my local hippie shop the other day – you know, crystals, wall hangings, incense, buddhas – just looking around. I saw some metal singing bowls and remembered that getting a singing bowl was on my list of important things to do this year. Why? Because singing bowls are a wonderful way to balance and harmonise the vibration of your environment, as well as your own energy, and others as well if you choose to use them as a healing tool. Each bowl comes with a felt covered mallet that you can use to strike the side of the bowl, or run it around the top of the bowl to make the distinctive humming song of the singing bowl. This is a four part TV miniseries starring Frances Dormand and Richard Jenkins, with appearances from Bill Murray and Martha Wainwright. I’ve been wanting to watch it for ages, but like all things that only I will like, I have to schedule it in ruthlessly :). Set in Maine, it tells the 25 year story of Olive, a cranky but strangely likeable school teacher and her husband Henry. It’s beautiful, people – so well done. Each episode resonated with me for 24 hours afterwards, and even now, when I have finished watching, it stays with me. There is no such thing as a simple life. Going from primary to a big school will be a big change indeed. What age/ grade does this happen in your country? Here in the US, my son is at a primary school from ages 5/6 in kindergarten to age 11/12 in sixth grade. Next year my son will move from our local smaller outlying elementary (primary) school of about 180 students (7 grades, one classroom for each grade) to our middle school of grades 7&8 of just over 600 students (313 and 314 per grade right now). Then on to high school for grades 9-12. In some ways I’m nervous about how my son will cope with having several different teachers and their differing expectations (a challenge for him), and how they will all handle my son’s IEP (individual education program- goals and accommodations because he’s behind his peers and has learning disabilities). But being able to change classrooms and teachers every hour each day will likely be a relief for my son. That beehive looks amazing! I wonder how in the world they do it without disturbing the bees. Looks like a real revolution and revelation for beekeepers. I’ve got to find a way to see that Olive Kitteridge. I love Frances Dormand, and I miss Maine so much (used to live there). She plays the accent quite well- at least in this video you showed- and it’s not easy to get right. We don’t have HBO because I’m too cheap to pay for it on top of what we already pay for our television service. I’ll find a way. That singing bowl is beautiful! I wish I could pop a picture into this comment to show you our little singing bowl that was my husband’s mother’s. It is also small and brass. Last spring, I was in a local shop with a gal pal, and they had several singing bowls. People were looking at them, not knowing what they were. I picked one up and made it sing. Then I taught them how to do it. My favorite metaphysical shop has several lovely crystal bowls that are amazing. Cheers! Olive! I don’t know enough about accents to comment, but Frances did a beautiful job of acting that part. Wow. I’ve already put Maine on my list of areas to visit when I go to America, which will need to be at least a two month trip the way I’m going! I’m glad you love my singing bowl! They’re amazing. I go to a monthly meditation group, where quite a few of us have bowls, and there is the constant sound of them throughout the session. I love the crystal ones too – I find them very responsive. All in all an interesting week-post. I love your bowl. I’ve had a go at singing bowls but don’t have one. 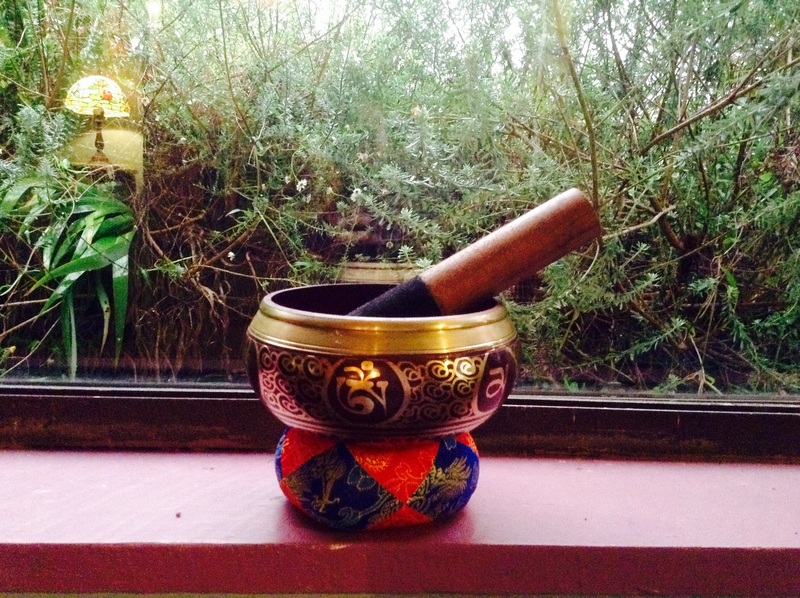 I have a lovely singing bowls meditation CD, that I play very loudly from time to time to shift negative energy. Stories about synchronicity are my absolute favourite! Brain Pickings is incredibly good value…there is so much work, research and reading that go into her articles. I hope she gets paid enough for her work. I’m so glad you enjoy what I write here, and read it so thoroughly. It makes me very happy! Is it a rainy day in Sydney? It’s very wet here – flood kind of weather, but you probably know that already! I rarely buy magazines, I save the purchase of an occasional one to read laying on the verandah futon! so I love to read blogs & newsletters where there are links and variety 🙂 Even better you have some similar interests plus a talent for new & interesting. Humid here. A shower this morning but feels like more rain due. I heard TA was expecting flood rain… I love getting flooded in there… but not always convenient! Like Jackie French says, it’s got to be the perfect book. The perfect book is like the key to their soul. I’ve always been a reader, ever since I was tiny, and I remember reading everything I could get my hands on, but I think it was Anne of Green Gables that really did it for me 🙂 Enjoy Olive Kitteridge, it was wonderful. I remember a few school startings when we moved and my kids were excited and a little scared going to new schools. And my own graduation from a grammar school of 500, going to a high school of 4,000. I felt intimidated that day, but then in the course of four years I found my way very well, and those first day fears quickly disappeared. I’ve seen also with my own children–one of my girls, and one of my boys–how they took the opportunity afforded by new surroundings and new people to reinvent themselves and come into their own. So many changes! Awesome that your son is devouring all those books. Maybe he will start a blog too! 🙂 Have a wonderful week ahead. PS, that shop looks awesome. I miss Oz – i lived in Brisbane for about a year, back in 2008. Our household needs a little harmonising, and we are of course in a land of singing bowls – so you impulse buy will inspire my next market purchase in amongst the goats, chooks, spices, pulses (of life), and chatter chatter of nepali. Ah, the thought of the bowls song makes my pounding head sooth a little (just got back from 6 hour bus trip – yuck!). Jackie French – awesome lady indeed. Nanberry I liked. And all her columns and comments about Chooks and all things simple living. Thanks for the welcome home read. Aha! He has never mentioned starting a blog (doing the things that I do holds little or no attraction for him), but my 6 year old daughter has been wanting to start a blog for ages – favourite recipes and such 🙂 I should really facilitate that, although my feeling is that she’s a little young yet. The shop is pretty cool – it’s very spacious with consult rooms and a yoga space as well. You lived in Brisbane huh? I have spent some time in Brisbane over the years – I went to the writers festival there a couple of years ago amongst other things – it’s a nice town. Even though it’s a city, it feels like a town, which I guess is part of its charm! I love your discussion about your son and getting him to read books — and him loving it. My mom tried to get me to read when I was a kid and I was never that interested until after I graduated from college. I think it’s partly because that’s when I was finally reading because I wanted to and not because I had to for school. But I also began discovering what really “Turned me on”: philosophy, religion, sociology… I’m glad your son caught the spark a lot earlier!